In this article, we are going to discuss the top ten ways to escape North Korea. Crossing the border between North and South Korea might seem like the most obvious way to escape Asia’s premiere dictatorship. After all, South Korea automatically accepts all refugees from the North and makes them full citizens. But if you’ve seen the buffer between the two countries, you’ll know that it’s not simply a case of popping over the border and enjoying some k-pop. Separating the two nations is a 250 kilometres long boundary called the DMZ, or Demilitarised Zone. The DMZ is full of landmines, barbed wire, and North Korean soldiers who patrol the area and shoot any potential escapees. Because nothing shows the world how great your country is like gunning down anyone who tries to leave. So, the South Korean border isn’t really an option for most people. However, there have been cases of the very soldiers defending the DMZ going AWOL and fleeing to the South. To date, three border guards have done this, most recently in 2015 when a teenaged soldier abandoned his post, walked up to the South Korean fence, and surrendered himself. With North Korea sandwiched between the Yellow Sea and the Sea of Japan, perhaps it’s not surprising that some North Koreans just jump in a boat and sail away. The problem with trying to escape on the water is that it means contending with North Korea’s ginormous navy. You see, while the Worker’s Party of Korea can’t find the money to construct roads or power lines, it has pumped millions into building world-class ways to murder people at sea. Apart from having 70 submarines, the most in the world, Kim Jong Un’s fleet is equipped with 191 patrol ships, specifically designed to blow fleeing vessels out of the water. This constant prowling of heavily-armed ships, added to the rough, unpredictable seas surrounding Korea, mean things tend not to work out for those making a break for the South. However, there are examples of this tactic working. In 2011, 22 defectors made it out of Northern waters, and were picked up by a South Korean naval ship. Believe it or not, Delta is not the worst airline in the world. That dubious honour goes to Air Koryo, North Korea’s one and only airline. With the airline’s meals being made out of an undisclosed “mystery” meat, and the only in-flight entertainment being propaganda films, perhaps it’s no surprise Air Koryo is the only one-star rated airline in the world. The planes are so run down, the flight’s stewards will tell you off if they catch you taking photos. On the other hand, with a service this bad at least there’s no risk of a long queue at check-in. Whatever its pros and cons for passengers, flying Air Koryo has one obvious potential benefit for staff: the opportunity to fly out of North Korea. Pilots and stewards are not monitored by guards or forced to return to Korea at the barrel of a gun. Although there are no known cases of it, flight’s crew could simply get out of the plane and walk off. The problem with this plan is that Air Koryo only flies to countries that are allies of the regime like China and Russia. That means even if a pilot did escape, the nation he’d flown to would just send him back again. Living in North Korea isn’t great at the best of times. That’s unless you’re Kim Jong Un and get to spend your time eating, skiing at luxury resorts, eating, smoking designer cigarettes, and eating. But for most people in the Asian nation, life is already pretty tough. So imagine how bad things get in a North Korean prison camp. It’s this threat that likely keeps most would-be defectors in line. Under the North Korean system, the entire family of anyone who flees the country will be rounded up and sent to join the 120,000 prisoners already interned in brutal labor camps across the country. Food in these camps is so scarce that prisoners have been reported to eat rats and pick the maggots out of dead bodies just to survive. Torture, including sleep deprivation and beatings with iron rods, is routine at the camps, and internees are expected to work 12 hour days ploughing fields. The horrible reality of these camps means that North Korean defectors are either forced to abandon their loved ones or take the increased risk of trying to leave with their entire families. 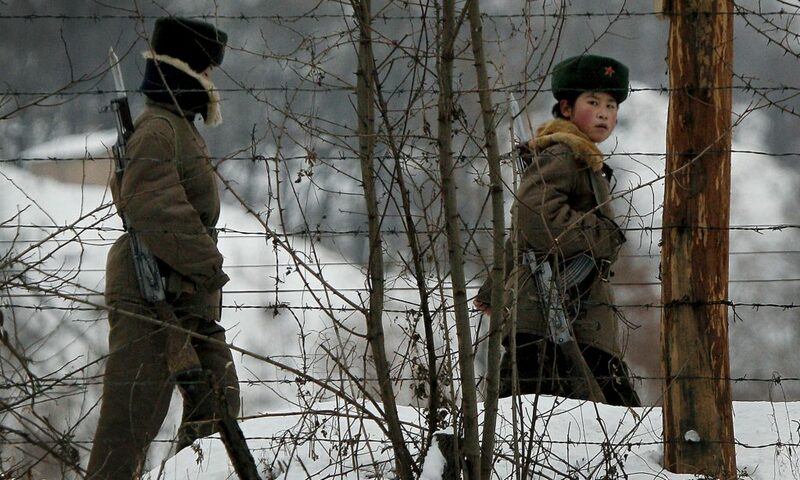 With the DMZ being 250-kilometres of barbed wire and bullets, the only other land-based option for fleeing North Korea is over the Chinese border. This relatively safe route is taken by hundreds of defectors every year and means crossing either the Tuman or the Yalu River. In the summertime, escapees try and wade through the waist-high rivers. But leaving in the winter means doing what the 15-year-old Joseph Kim did in 2006, and tip-toeing carefully over the frozen waters to safety. And the deadly terrain is far from the only danger facing potential defectors. Kim Jong Un has recently reinforced the border, with his troops spending the last couple of years constructing electric fencing along the Tumen River. On top of all that, troops are constantly patrolling the area. Grace Jo, Vice-President of the refugee support group NKinUSA, describes how her father was caught crossing the Chinese border to bring back some rice for her family. He was beaten to within an inch of his life and sent to a work camp, dying on the train there. Despite the overwhelming risks, this route remains the most popular, and the one taken by the vast majority of the 30,000 successful North Korean defectors. North Korea doesn’t have many allies. It turns out pointing nukes at people is a bad way to make friends. However, one of the few countries that does support Kim Jong Un’s regime is China. Their government will deport any and all North Korean defectors it captures, and China’s police force even routinely stake out the South Korean embassy to arrest any suspected North Koreans on the way in or out. All of this means that simply crossing the border into China is not enough for the North’s runaways. They then have to travel all the way through the country into either Thailand or Mongolia. Thankfully, defectors can expect some help from Asia’s underground railroad, a network of activists that finds North Korean escapees and helps funnel them out of China. Over the years, South Korean Pastor Kim Seung-Eun, has helped dozens of defectors to escape to Laos. This means a 12-hour nighttime trek through the mountains, carefully avoiding any border security. And as if that wasn’t enough, the journey has recently become even harder. In 2013, Laos started proactively hunting for North Korean immigrants and deporting them back to Pyongyang. So to reach safety now, refugees must sneak through Laos’ jungles and into Thailand, or trek through the Gobi desert into Mongolia. If you want a gap year story to top anyone else’s, try taking some time out to study abroad in North Korea. Yes as strange as it sounds, even crazy dictatorships like North Korea run a student exchange programme. The scheme hasn’t proved popular with Westerners, probably something to do with not wanting to live in a repressive autocracy where everyone thinks you’re the devil. But every year about 90 Chinese students for a year at Kim Il-sung University in Pyongyang. More importantly, the student exchange also means that a select few North Koreans are allowed out of the country. Although students are closely monitored by government agents, the relative freedom of being in another country makes escape easier. In February 2017, 18-year-old student managed to run away while representing his country at the International Maths Olympiad in Hong Kong. Taking a taxi to the airport, he found a South Korean airline and asked for directions to their consolute. There Yol-ri spent two months holed up while the consolute negotiated with China, eventually securing his safe passage to South Korea. We’ve already looked at the problem with escaping North Korea by boat. Namely that the navy will blow you to pieces the second you drift a little too far. But a number of desperate people have been known to successfully swim across the sea to the South. In 2014, two men swam two and a half kilometres from the North Korean coast to the South Korean island of Gyodongdo. Travelling in the dead of night to avoid detection, the two swimmers were spotted by local marines at 4AM and pulled out of the water. The advantage of trying to swim across the sea is that it’s next to impossible for even the most zealous patrol ship to spot a single swimmer out amongst the waves. But, as with, any attempt to leave North Korea, it’s fraught with peril. As mentioned earlier, the waters around Korea are rough. And most North Koreans have been starved to the point where they barely have enough energy to run, let alone force their way through kilometres of turbulent waves. You know your country is messed up when people are volunteering for Siberian labor camps just to leave it. For decades now, North Korea and Putin have had a deal. Kim Jong Un sends over thousands of citizens to toil in Russian labor camps, where they work on giant construction projects like the new World Cup stadium. No, we’re not making that up. In return, Putin pays Pyongyang around $7 million a year. That money is then spent back in North Korea to better the lives of citizens at home… I’m just kidding, the government blows it all on massive missiles and keeping Kim Jong Un drunk. Regardless, these work camps can actually be a great opportunity for fleeing North Koreans. After all, it’s a lot easier to escape one work camp than an entire country. According to Choe Myong-bok, who slipped past the guards of his Siberian camp in 1999, as many as 40 North Koreans have defected this way. Like any corrupt system, life in North Korea is way, way better for the elite. While the masses are driven so hungry many resort to cannibalism, wealthy party members use mobile phones, wear designer clothes, and drink $9 coffees. Yep, even North Korea has hipsters. For this upper class, there may be less need to leave North Korea. But it’s also far easier to do so. Apart from just having more money to bribe border guards and buy transportation with, party members often have privileges the average citizen could only dream of. Take the case of Thae Yong Ho, North Korea’s highest-ranking defector. The former diplomat spent years stationed in the United Kingdom. And while most citizens posted abroad have to leave their families behind, Thae eventually managed to have his his wife and children with him to London. Once they were safely in Britain, Thae and his family simply turned themselves over to the South Korean authorities. What heroic dash for freedom was your favorite? Did we leave any great escapes off the list?